The Danish Association of Construction Clients (DACC) is an interest group representing professional construction clients in Denmark. The association was established in 1999 by 28 leading (mostly public sector) clients with support from the Ministry of Housing with the goal to influence and improve the Danish construction sector. The historical background was a public wish for increased demand for productivity improvements and greater customer orientation in construction. 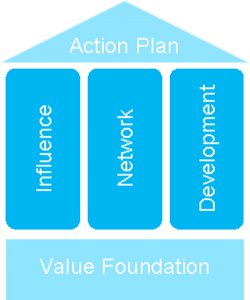 DACC has three strategic focus areas: influence, network and development. 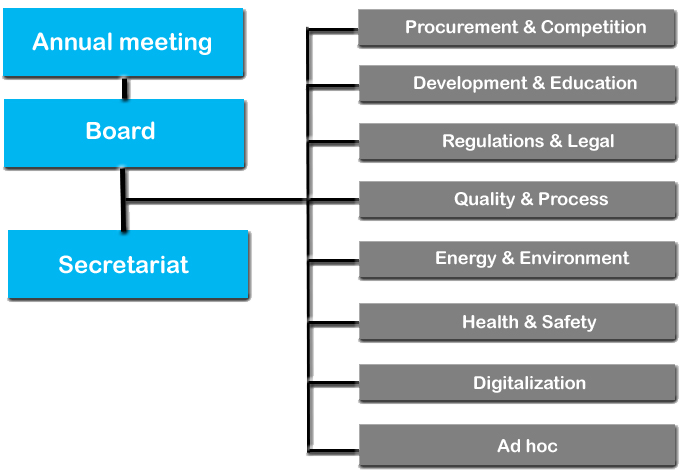 The Danish Association of Construction Clients is organized as illustrated below and the daily administration lies in the hands of the secretariat, which also serves as a support function for the board and work groups. The secretariat is the administrative heart of the organization. The secretariat carries out the board’s decision, supports the work groups in their tasks and services the members. In addition the secretariat arranges various events, seminars, conferences, etc. For further information, please contact director Henrik L. Bang, M.Sc. and PhD. The Danish Association of Construction Clients organizes approximately 140 professional Danish construction companies. Our list of members consists of more than 1,300 decision makers from the Danish construction industry, representing a construction volume of 6.7 bn. EUR per year. Click here to see a list of the construction clients who are currently members. DACC’s purpose is to promote positive, socially responsible development in Danish construction including improvement of architecture, quality and productivity as an influental voice.